08 August 2011, 17:05 p.m. It was one of those weeks where the world wobbled. The US lost its AAA credit rating, the FTSE100 saw £150bn wiped off the value of its shares and a crisis of confidence struck the Eurozone – again. Thankfully, there was some respite and joy for B2B Marketers – well, those who weren’t crying into their dwindling pension pots. Holidaying world leaders may have missed it, but not us… the good people at Marketing Sherpa shared the latest findings on how B2B marketers are optimising their funnels in this insightful Infographic. 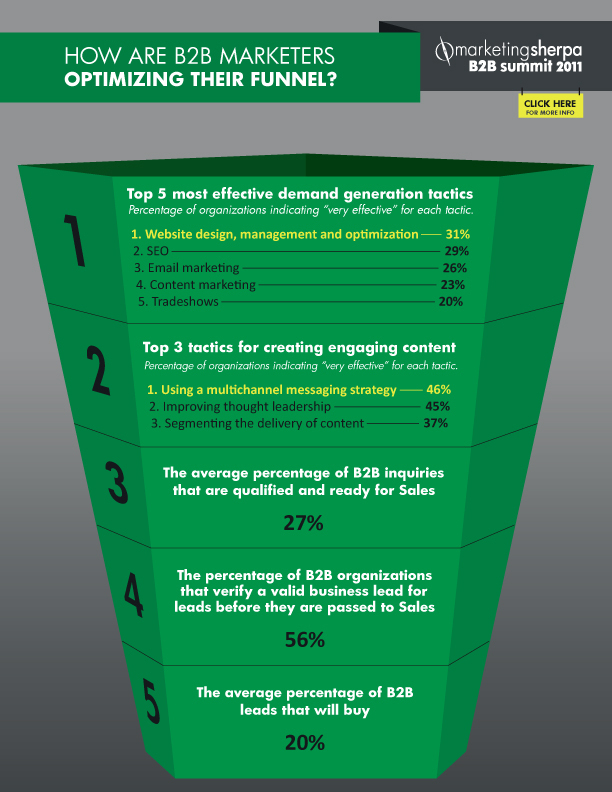 It’s not pretty but worth a look – even if it’s just to find out that on average only 20% of B2B leads buy. Sorry we’ve spoilt it for you now. Team Earnest has been purring over some of the latest stop motion animations that have recently been flung our way. First off, the world’s ‘largest stop-motion animation’ to promote the new Nokia N8 shot on the lovely Pendine Sands in South Wales. And then it’s predecessor, the world’s ‘smallest stop-motion animation’ also by Nokia. Finally and a little bit older, the Big Bang Big Boom wall-painted animation is time well spent as you ponder – why, how, and by golly they’ve got a lot of time on their hands. Yes those funny indecipherable squares are popping up all over the place – and it’s just a matter of time before you’re going to see them emblazoned over b2b communications aplenty. Here’s how Reporters without borders used QR codes to great effect, even winning 3 Cannes Lions. They used to call them Crackberrys – and now with the popularity of iPhones, Android Phones et al, we’re told the problem is far worse than we thought. In fact, we are a nation of addicts according to Ofcom. Some 81% of owners keep their Smartphone switched on all of the time, even in bed. At least it means they can read your fascinating white paper from the comfort of the lavatory. With nearly half having downloaded an app (not more?) – and more admitting their social and work time is becoming increasingly blurred, what do you say – isn’t it time us b2b folk took the whole mobile thing a little more seriously. This is the week that was. Who knows what the next week has in store, apart from more global financial crises, riots on the streets of London and undoubtedly some new infographics. All the best. Earnest is a full service marketing agency combining game-changing strategy and creative to deliver real results for clients in the business-to-business space. They specialise in helping brands stand out from the crowd; devising high performance marketing strategies; and developing campaigns that surprise, engage and perform in equal measure.